[ABOVE] A picture postcard of Railway Approach, East Grinstead, produced by Edgar Kinsey's East Grinstead Photo Company, 24 Railway Approach, East Grinstead (c1910). At 22 Railway Approach, to the left of Edgar Kinsey's shop, is the business premises of William Major, watchmaker. (This shop was previously owned by watchmaker and photographer, Arthur Harding). On the right of the photograph, a man stands in the doorway of the butcher's shop owned by Muggridge & Sons. 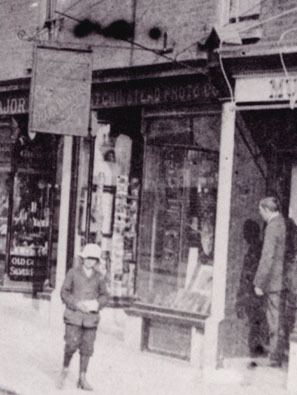 [ABOVE] Detail from the photograph of Railway Approach (pictured left) showing Edgar Kinsey's shop at No. 24. The shop front fascia reads "THE EAST GRINSTEAD PHOTO CO."
[ABOVE] A picture postcard of London Road, East Grinstead, produced by the East Grinstead Photo Company, 24 Railway Approach, East Grinstead. The East Grinstead Photo Company was the name of the studio at 24 Railway Approach (Glen Vue/ Glen View Road), East Grinstead, operated by Edgar Orlando Kinsey between 1905 and 1930. Edgar Orlando Kinsey was born at Pakenham, Suffolk in 1880, the youngest son of Charlotte and Orlando Kinsey, a farm bailiff who was based at Bridge Farm, Pakenham. [ Birth registered in the Thingoe District of Suffolk during the 2nd Quarter of 1880]. Orlando Thomas Kinsey, Edgar's father, was born at Stanton in Suffolk in 1839, but he began his working career in London. In 1871, Orlando Thomas Kinsey married Charlotte Emma Death (born c1844, Pimlico, London) at St. George's, Hanover Square, London. The couple settled in North London, where their first two children were born - Charlotte Kate Kinsey (born 1873, Edgware) and Oliver Thomas Kinsey (born 1874, Hampstead). Around 1877, Orlando Kinsey returned to his home county of Suffolk and found employment in Pakenham, Suffolk. Orlando and Charlotte's two youngest children were born in Pakenham - Alice Sophia Kinsey in 1877 and Edgar Orlando Kinsey in 1880. By 1891, Orlando Kinsey and his family had gone back to London. Edgar Orlando Kinsey became a picture framer and around 1905, he purchased William Smith's picture-framing business at 24 Glen Vue Road, East Grinstead. Watchmaker and part-time photographer Arthur Harding, previously occupied the shop next door at 22 Glen Vue Road. Edgar Kinsey's cousin, Edward Albert Kinsey (born 1877, Stanton, Suffolk) was also a professional photographer. It is possible that either his cousin or his neighbour Arthur Harding encouraged Edgar Kinsey to take up photography. In 1906, East Grinstead's Glen Vue Road was renamed "Railway Approach". A cabinet photograph of a woman, produced by the East Grinstead Photo Company of 24 Glen Vue Road, East Grinstead (incorrectly spelt "Glen View Road" on the card mount), indicates that Edgar Kinsey established his photographic studio before 1906. Edgar Kinsey's East Grinstead Photo Company is best known for the picture postcards that were issued under that name between 1906 and 1918, yet it is clear that Edgar Kinsey also took portrait photographs at his studio in Railway Approach (see examples on the right). Although local trade directories list Edgar Kinsey as a picture frame maker at 24 Railway Approach, East Grinstead, the East Grinstead Photo Company does not generally feature in the list of photographic studios which appear in the commercial sections of the directories. 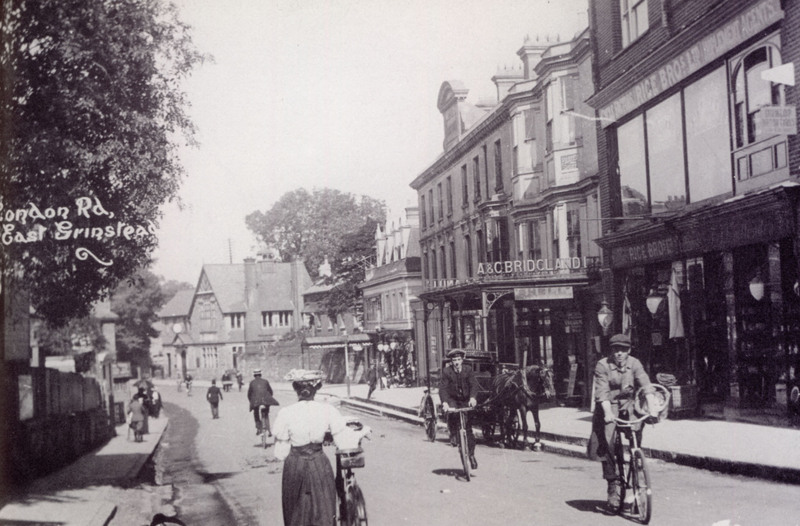 Edgar Kinsey took photographs of notable events and occasions in East Grinstead (e.g. parades, processions, sporting events, dances, and other social activities), but he also produced a number of picture postcards showing views of the town. 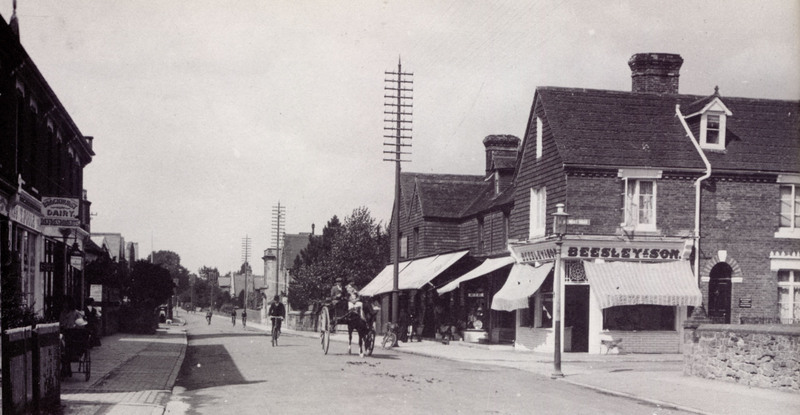 Kinsey's photographs of the main streets and buildings around East Grinstead usually carry a white picture caption on the face of the photograph, written in distinctive and attractive lettering. [ABOVE] A picture postcard of East Grinstead's London Road, produced by the East Grinstead Photo Company, 24 Railway Approach, East Grinstead (c1910). The shop of William Beesley & Son, fishmongers, at 189 London Road, can be seen at the junction with Moat Road on the right. [ABOVE] A hand-tinted cabinet portrait of a woman by the East Grinstead Photo Company, 24 Glen View Road, East Grinstead (c1905). The original portrait probably dates from around 1895, but Edgar Kinsey has re-photographed and coloured the copy photograph. In 1906, Glen View Road was renamed Railway Approach. [ABOVE] A picture postcard portrait of a man with a moustache by the East Grinstead Photo Company, Railway Approach, East Grinstead (1912). The message written in ink on the reverse of the postcard reads : "To Dora & Herb, With the Compliments of the Season, 1912. Harry." [ABOVE] The trade plate of Alfred Francis, photographer of West Street, East Grinstead, as shown on the reverse of a carte-de-visite portrait (c1870). Alfred Francis was an assumed name - the photographer's real name was Alfred John Gear. Alfred Francis was the name adopted by coach painter Alfred John Gear when he established a photographic portrait studio in West Street, East Grinstead around 1866. Alfred John Gear (aka Alfred Francis) was born in Paddington, London around 1832, the son of John Gear. On 5th December 1852 at St James's Church, Paddington, Alfred John Gear married Mary Ann Katharine Banton (born c 1836, Highbury, North London). Alfred Gear found work in Sheffield, Yorkshire, and by 1855, he and his wife had settled in the Ecclesall district of Sheffield. The couple's first child, Walter Francis Gear was born towards the end of 1855 [The birth of Walter Francis Gear was registered in the district of Ecclesall Bierlow during the 4th Quarter of 1855]. Kate Gear, Alfred and Katharine Gear's second child was born in the same district of Sheffield during the 1st Quarter of 1858. By June 1860, Alfred Gear and his family had moved to Nottingham, where Alfred Gear junior was born during the 2nd Quarter of 1860. When the 1861 census was taken, the Gear family were recorded in Sussex, but Alfred and Mary Ann's fourth child Laura Gear was born in London the following year. By the end of 1864, Alfred Gear, his wife Mary Ann, and their four children were living in East Grinstead. The couple's fifth child, Minnie Augusta Gear was born in East Grinstead during the 4th Quarter of 1864. There were to be four more additions to the Gear family during their time in East Grinstead - Nelly Gear (born 1866), Fanny Gear (born 1869), Ada Louisa Gear (born 1869) and Agnes Mary Gear, who was born in East Grinstead on 28th September 1873. Alfred Gear was a coach painter by trade, but around 1865 he decided to supplement his income by setting up a photographic portrait studio at his home in East Grinstead's West Street. Possibly to distinguish his photography business from his regular employment as a coach painter or perhaps to separate himself from a previous, unsuccessful venture that was attached to his real name, Alfred Gear adopted the name of Alfred Francis for his photographic activities. 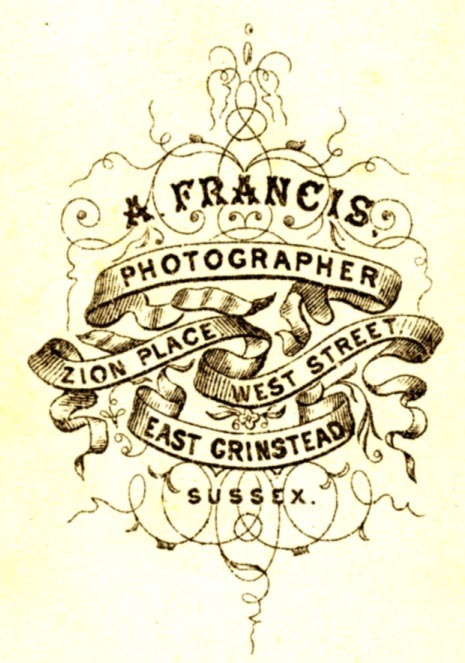 J. G. Harrod's Postal & Commercial Directory of Sussex, published in 1867, lists Alfred Francis as a photographer in West Street, East Grinstead. Only one other professional photographer is mentioned in the commercial listings for East Grinstead and that was William Harding (c1838-1922), who was primarily a topographical photographer who produced views of East Grinstead's streets and notable buildings (see below). Occasionally, Alfred Francis also produced views of the town in the carte-de-visite format ( East Grinstead Museum has a carte-de-visite view of St Swithun's Church by Alfred Francis, dating from around 1866). At first, Alfred Gear's career as "Alfred Francis the photographer" appeared to be going well and when William Harding abandoned photography and found work as a "journeyman painter" around 1868, Alfred Gear / Alfred Francis found that he had no real competitors in the field of photography and that he held a virtual monopoly when it came to taking of photographic likenesses in the town. 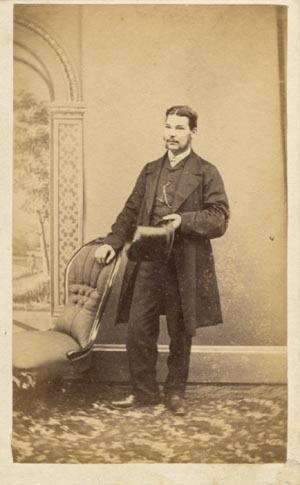 However, Alfred Francis's reign as East Grinstead's sole photographer was swiftly brought to an end with the arrival of Henry Thomas Melville (born c1833, Boughton, Kent), an experienced professional photographer from Bromley in S. E. London. Alfred Francis's trade must have been affected by the competition provided by Henry Melville. The Bromley photographer had established a photographic portrait studio at Grove House in West Street, the same street where Alfred Francis (Alfred Gear) operated his portrait studio. Matters got worse for Alfred Gear (Alfred Francis) when he became paralysed down one side of his body. Alfred became increasingly depressed and, apparently, he feared that he was going to go mad. ( Alfred's brother was already in an asylum). In May 1874, Alfred told his wife, Mary Ann, that "he felt as if he did not know what he was doing ; as if something was going to happen". [ABOVE] The trade plate of Alfred Francis, photographer of Zion Place, West Street, East Grinstead, as shown on the reverse of a carte-de-visite portrait (c1867). [ABOVE] The 1871 census return for Alfred John Gear and his family residing in West Street, East Grinstead. Although Gear was his legal surname, Alfred had informed the census enumerator that he, and all the members of his family, went under the surname of Francis. In fact, aft birth, each of Alfred's children had been registered with the surname "Gear". Alfred Francis (Alfred Gear) was found dead on Monday 1st June 1874 at his studio in West Street, East Grinstead. At the inquest it was concluded that Alfred John Gear, aged 43, working as a photographer under the name of Alfred Francis, had killed himself by swallowing a quantity of cyanide of potassium, a poisonous chemical used in photography. The inquest jury reached a verdict that Alfred Gear had committed suicide "whilst in a state of unsound mind". The inquest jury was told that on Monday, 3rd June, Alfred Gear was talking to a female customer about a carte-de-visite order. When Alfred Gear enquired about how many copies of the carte-de-visite she wanted, the woman replied "One." Looking at the woman, Alfred Gear made the comment "That is a strong order !" and then laughed out loud. It appears that this minor, but dispiriting, incident triggered the tragic event that followed. Five minutes after the meagre order was placed, Alfred Gear drank cyanide of potassium from a glass tumbler. After her husband's death, Mrs Mary Ann Gear and her children left East Grinstead. The grown-up children found work, but Mary Ann took her youngest children with her to Lancashire. A year after her husband's tragic end, Mary Ann Gear, a 38 year old widow, married Edward Thomas Fletcher in Rochdale, Lancashire. Edward Fletcher (born c1837, St Pancras, London ) worked as a plumber & gasfitter and was a widower with two sons of his own. Edward Fletcher fathered two more children with Mary Ann - Hannah Fletcher (born 1876, Rochdale) and Alice Louise Fletcher (born 1878 - died 1884, Rochdale). In 1901, Walter Gear, the eldest son of Alfred Gear (Francis), was working in London as a coach painter, like his father before him. It is not known whether Walter Gear ever worked as a photographer. [ABOVE] The death of the photographer Alfred Francis as reported in The Brighton Guardian of 3rd June 1874. The following week, when the newspaper covered the inquest into the death of the photographer, the Brighton Guardian referred to the deceased by his real name of Alfred Gear. [ABOVE] A report of the inquest into the death of the Alfred Gear, photographer (The Brighton Guardian of 10th June 1874). In the previous issue of the newspaper, the dead man was named as "Alfred Francis, a photographer". [ABOVE] A portrait of William Harding. 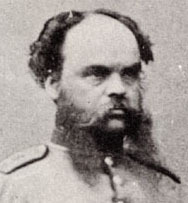 This detail from a full-length carte-de-visite is believed to be a portrait of the East Grinstead photographer in the uniform of the Sussex Rifle Volunteers. William Harding was born in Charlwood, Surrey, around 1838, the eldest son of Sally and Thomas Harding, a draper and grocer who settled in East Grinstead around 1841. Thomas Harding (born c1810, Surrey) married Sally Wright (born c1815, Surrey) at Horley in Surrey on 2nd May 1836. The couple spent the early years of their marriage in the Surrey village of Charlwood, where their first two children were born - William Harding (born c1838) and Edwin Harding (born c1840). By the time the 1841 census was taken, Thomas Harding had crossed the border between Surrey and Sussex and set up a drapery and grocery business in the town of East Grinstead. 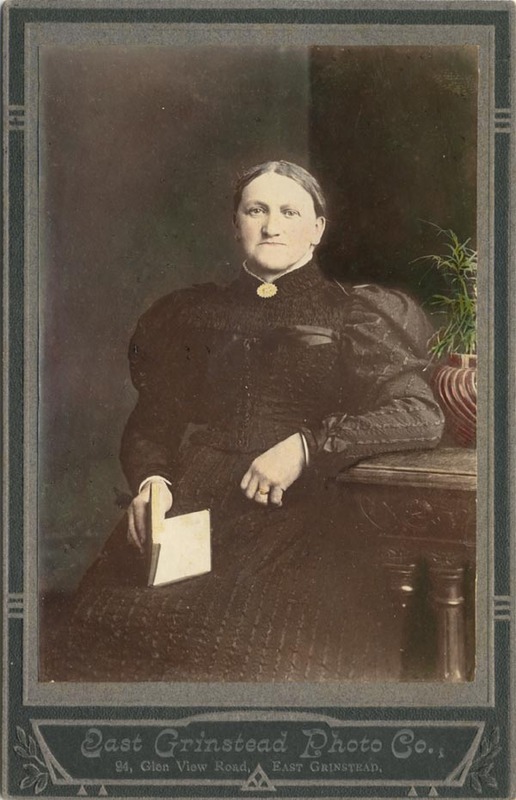 Thomas and Sally Harding's third child, a daughter named Clarissa, was born in East Grinstead during the 2nd Quarter of 1841. Three more daughters followed - Emily (born 1843, East Grinstead), Ann (born 1845, East Grinstead) and Dedamiah (born 1848, East Grinstead). In the 1851 census, Thomas Harding is recorded as a "Draper & Grocer", aged 41, of High Street, East Grinstead. At the time of the 1861 census, twenty-two year old William Harding was working as an assistant to John Southey, a grocer and draper in East Grinstead's High Street, but not long after the census was taken, William Harding was running a tobacconist's shop in Middle Row, East Grinstead. Edward Steer, who married Harding's sister Ann in 1866, recalled that William Harding "later on added photography" to his tobacconist's business in Middle Row*. William Harding's entry into professional photography probably took place in 1862, the earliest date printed on his published photographs. [ABOVE] A view of the East Grinstead Toll Gate, photographed by William Harding in 1864. The toll-gate, which was situated at the southern end of the town, was removed some time after 1865, when the London-East Grinstead Turnpike Trust was wound up. The Toll House is the low building on the left. The tower of St Swithun's church can be seen centre-right in this photograph. [ABOVE] A carte-de-visite portrait of William Harding of East Grinstead holding a cornet. This full-length portrait is reputed to be a studio portrait of the East Grinstead photographer in the uniform of a band sergeant in the Sussex Rifle Volunteers. This portrait was later issued as a picture postcard carrying the caption "C. Coy.,5th S. R. V. Et Grinstead, 1864". 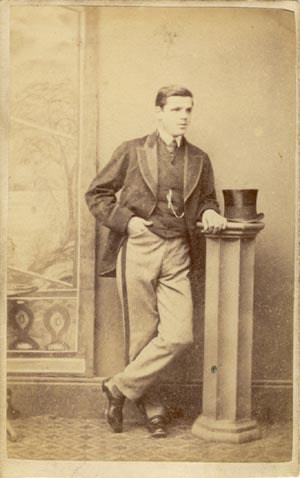 William Harding would have been about 26 years of age in 1864. 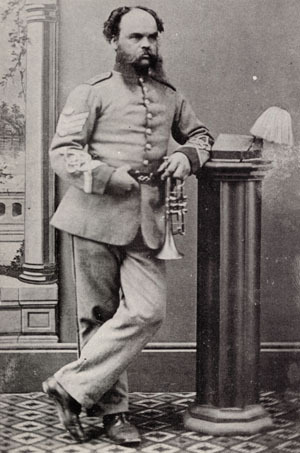 The subject in this portrait looks rather older than twenty-six, although it is reported that Harding was a "fairly good musician" and he might have played cornet in the army band. 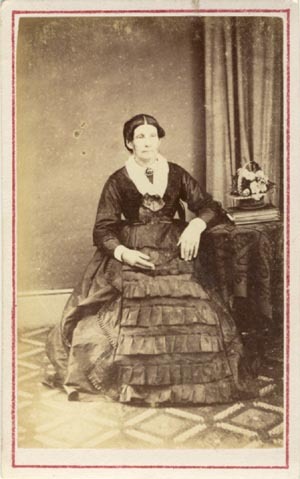 The date on the caption is probably incorrect and judging by the studio setting, the original portrait was probably taken by Alfred Francis around 1870. 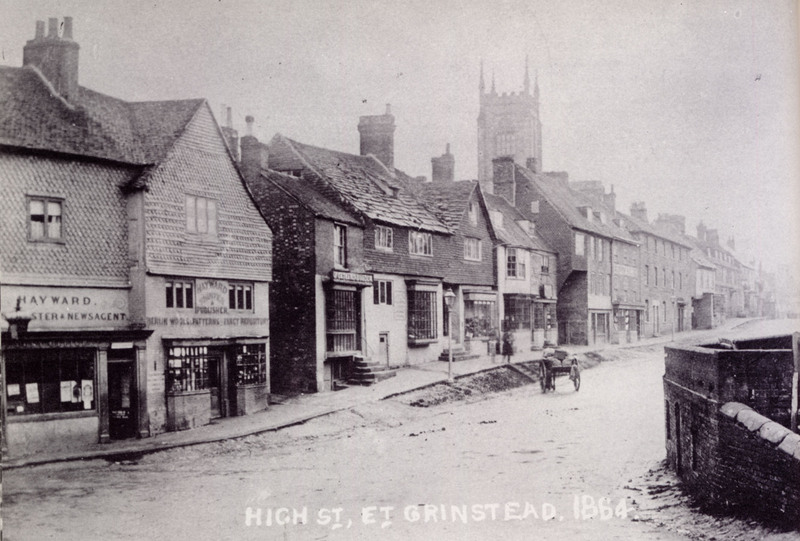 [EAST GRINSTEAD MUSEUM] Around 1862, William Harding began taking photographic views of East Grinstead. To begin with, Harding's photographic activities were a sideline to his main business of selling cigars and tobacco at his shop in Middle Row, but by 1864 he was regarded as a professional photographer. The Post Office Directory of Sussex, published in 1866, records William Harding as a photographer with premises at High Street, East Grinstead. William Harding worked almost exclusively as a photographer of buildings. 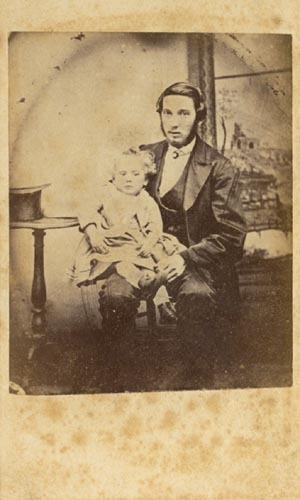 He may have produced some photographic portraits in the early part of his career, but by 1866 he had been joined in East Grinstead by Alfred Francis (Alfred John Gear), who mainly produced carte-de-visite portraits at his studio in West Street. 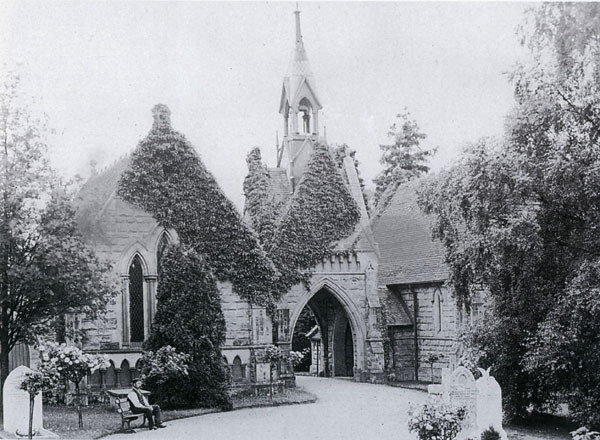 East Grinstead's population rarely provided enough custom for two portrait photographers and so it probably suited William Harding to concentrate on his architectural and landscape photography. William Harding became well known for his topographical views of East Grinstead and nearly every street and significant building in the town was recorded by Harding's camera in the period 1862-1867. 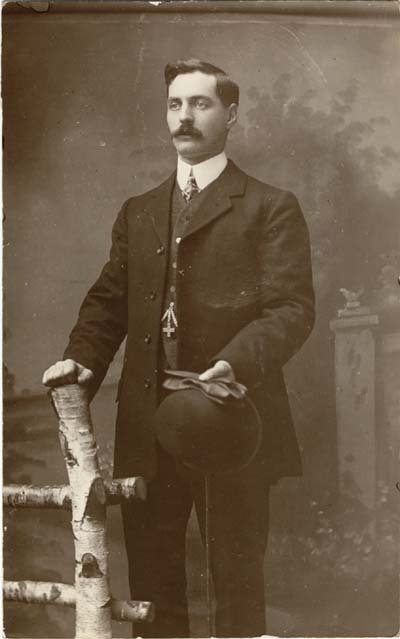 William Harding worked as a professional photographer in East Grinstead for only a short period of time. By the late 1860s, William Harding was employed as a "journeyman painter" and living in Glen Vue Road (Railway, Approach), East Grinstead. By 1868, William Harding had married. On 24th July 1869, at their home in Glen Vue Road, East Grinstead, William's wife Mary (born c1840, St Pancras, London, Middlesex) gave birth to a son named Edwin Arthur Harding. William Harding is described as a "Journeyman Painter" on Edwin Arthur's birth certificate, which indicates that William's career as a professional photographer had come to an abrupt end around 1868. By the time the 1871 census was taken, William and Mary Harding and their son Edwin Arthur had left East Grinstead and were living across the border in Surrey. William Harding worked as a painter for the next ten years or so. When the 1881 census was taken, William Harding, his wife Mary, and their eleven year old son Edwin were residing at Lady Cross, Witley, in the Surrey district of Hambledon, about two miles south-west of Godalming. William Harding is described on the 1881 census return as a forty-one year old "Painter". William Harding produced a large number of topographical views of East Grinstead in the 1860s. A quantity of Harding's original glass negatives were discovered at Henry Foster's East Grinstead Pottery Works. 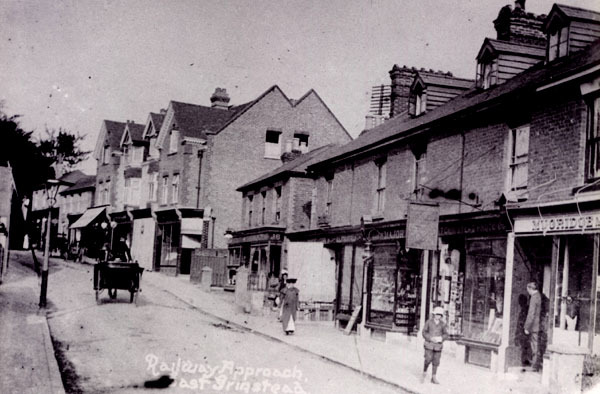 A selection of Harding's views were re-issued as picture postcards by East Grinstead stationer Henry Daniels from his shop at 18 London Road in the early 1900s. ( Harry Daniels, the son of a gamekeeper, was born in Balcombe, Sussex in 1870, but came to live in East Grinstead as an infant. Harry Daniels established himself as a Stationer & Tobacconist at 18 London Road around 1897, and he was residing in the town at the time of the 1901 census. Harry Daniels closed his stationery business in London Road some time before 1905 ). High Street, including Hayward's stationery shop at No.1 (1864); High Street, including St Margaret's (Orphanage) Home; High Street, including James Bridgland's ironmonger's shop; High Street , including Cromwell House and Porch House (1866); High Street, including Dorset House; High Street , including Charles Sawyer's grocery shop at No.43 (1864); High Street, including the premises of Henry Gatland, Corn, Coal & Coke Merchant (1864); High Street and Middle Row (1864); High Street, including Albion House (1864) ; Middle Row and High Street with George Bailye's tailor shop. London Road with saddler's shop; London Road with timber-clad cottages; Robert Pink's Cabinet & Upholstery Warehouse, London Road (1866). 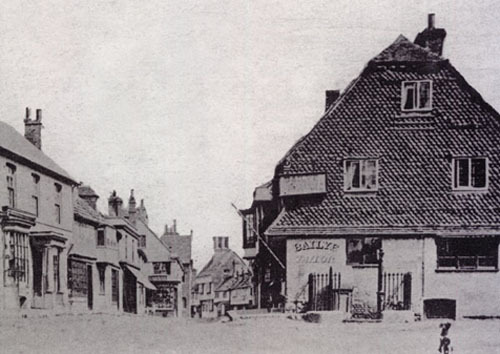 [ABOVE] A view of East Grinstead's High Street , photographed by William Harding in 1864 and reproduced as a picture postcard by stationer Harry Daniels nearly 40 years later. On the extreme left at No. 1 High Street, are the business premises of James Hayward, printer, stationer, newsagent and proprietor of the "Berlin Wool and Fancy Repository". The tower of St Swithun's church can be seen in the background. [ABOVE] A view of Middle Row, East Grinstead, photographed by William Harding in 1864. 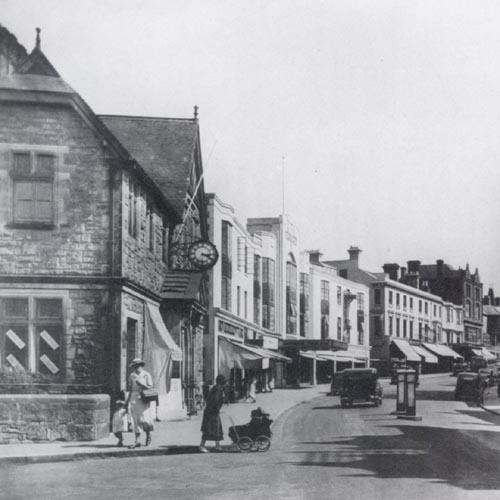 The building on the right belonged to George Bailye, a tailor and hairdresser who resided in East Grinstead's High Street. The town well and pump, enclosed by railings, can be seen in front of Bailye's tailor shop. William Harding was managing a tobacconist's shop in Middle Row in the early 1860s around the time he took up photography. 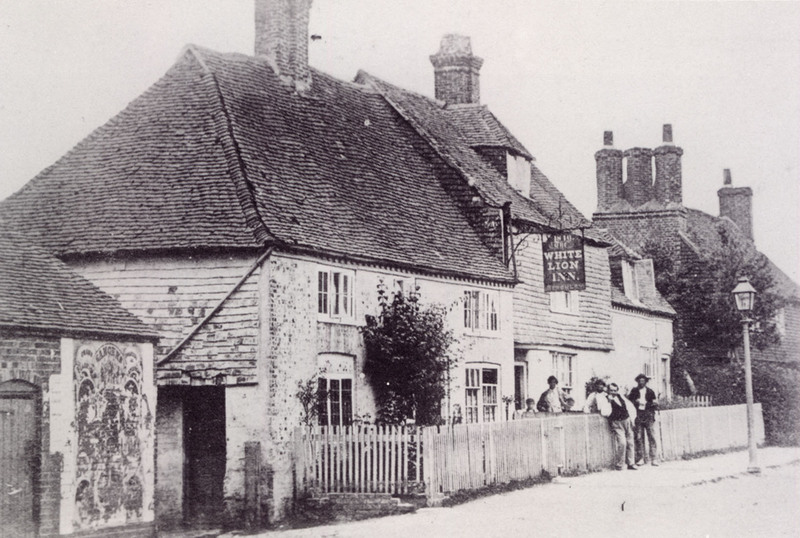 [ABOVE] A view of the White Lion Inn, London Road, East Grinstead, photographed by William Harding around 1864. 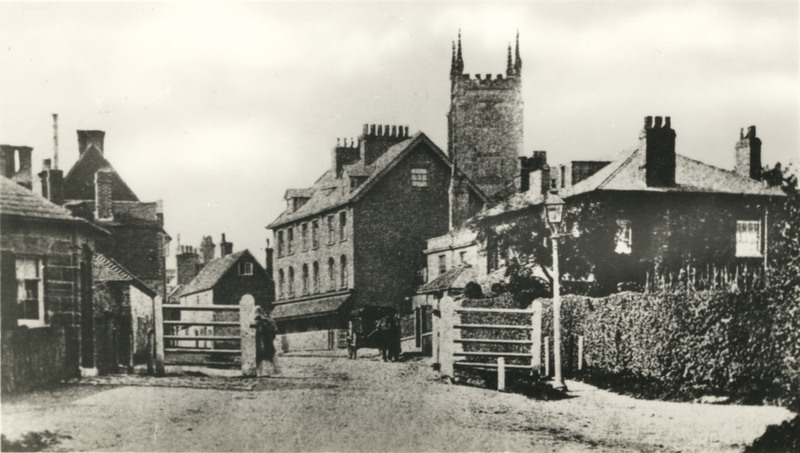 The man in the white shirt and waistcoat leaning on the fence is probably William Betchley, who was the landlord of the White Lion Inn in the mid 1860s. 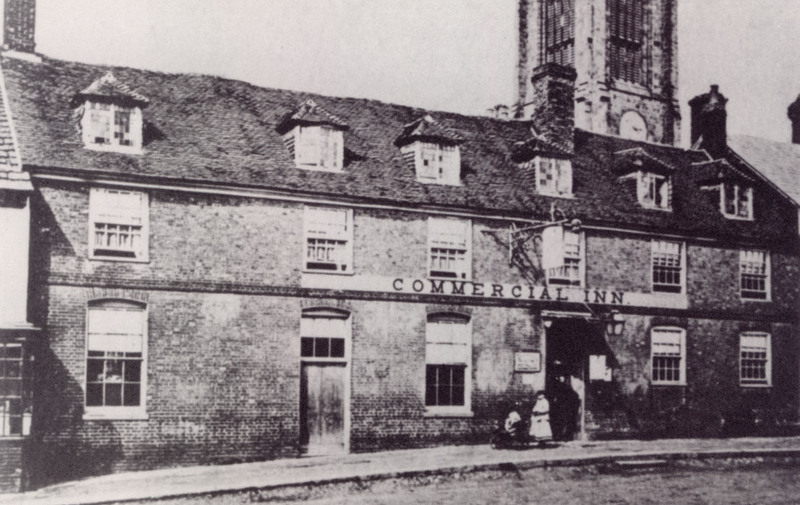 [ABOVE] A view of The Crown Commercial Inn, 35-37 High Street, East Grinstead, photographed by William Harding around 1864. The clock tower of St Swithun's church can be seen behind the inn, on the right. The people in the doorway could be the family of William Head, the proprietor of The Crown. It appears that William Harding returned to East Grinstead in the mid 1880s to become manager of the new Elephant's Head coffee tavern. When the Elephant's Head closed down, Harding found employment with The Literary & Scientific Institute in London Road. When the 1891 census was taken, William Harding was recorded at 55 London Road, East Grinstead, next door to The Literary & Scientific Institute at No. 57. By this date, William Harding was a fifty-one year old widower and was employed at The Literary & Scientific Institute as a "Librarian". According to Ron Michell and David Gould, Harding "was librarian at the Literary & Scientific Institute from 1887 ". By 1895, William Harding was managing the Public Coffee Bar, a coffee tavern attached to the Literary & Scientific Institute at 57 London Road. In Kelly's 1918 Directory of Sussex, William Harding is listed as the Proprietor of the Institute's Public Coffee Bar. By this date, William Harding had been appointed as Assistant Secretary of the Literary & Scientific Institute. William Harding worked as the Literary & Scientific Institute's Assistant Secretary and Librarian and ran the Institute's Public Coffee Bar until his death in 1922. William Harding, East Grinstead's earliest resident professional photographer, died at East Grinstead on 12th May 1922, at the age of 84. [RIGHT] The Literary & Scientific Institute building on the corner of East Grinstead's London Road, as shown in a 1930s photograph. This attractive building, with its porch entrance and distinctive clock, was William Harding's place of work from around 1887 until his death in 1922. William Harding was employed as the Institute's Librarian from 1887 and was eventually appointed to the position of Assistant Secretary. Harding also managed the Institute's Public Coffee Bar. The Literary & Scientific Institute building was demolished in 1938, not long after this photograph was taken. 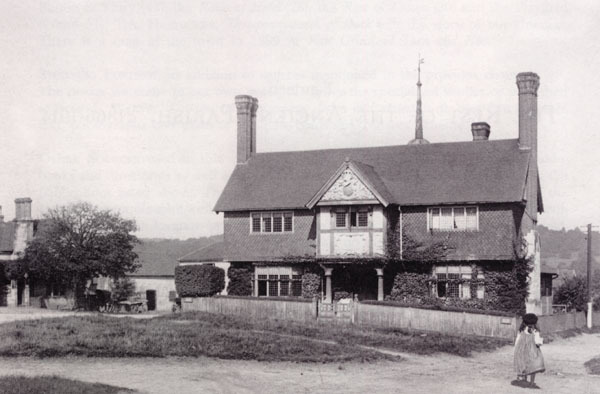 Edwin Arthur Harding, the only son of East Grinstead's early photographer William Harding, was born on 24th July 1869, at the family home in Glen Vue Road (Railway Approach), East Grinstead. 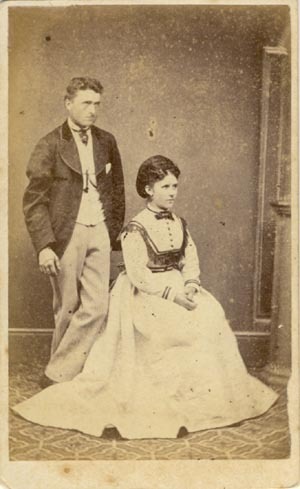 Edwin's parents, Willaim and Mary Harding, left East Grinstead shortly after his birth and by 1871 the Harding family were living in the neighbouring county of Surrey. Edwin Harding, who preferred to be known as Arthur Harding, was apprenticed to a watchmaker and, around 1899, he opened his own watch making business in Glen Vue Road (Railway Approach), East Grinstead. Kelly's Directory of Sussex record Arthur Harding as a watchmaker at 22 Glen Vue Road, East Grinstead between 1899 and 1905. In Kelly's Directory of 1905, the jeweller's shop at 22 Glen Vue Road had passed to brothers Rowland and Frederick Winser. (After 1906, Glen Vue Road was known as Railway Approach). On 12th September 1900, at Paddington in London, (Edwin) Arthur Harding married Gertrude Mary(May) Jago (born1876, Wanstead, Essex), the daughter of Mary Ann and James Thomas Jago, a London-born ironmonger. Arthur and Gertrude Harding's marriage produced two daughters, but following his "misconduct" with a teenaged domestic servant named Amy Truckle, the couple divorced sometime after 1905. In the 1901 census of East Grinstead, Edwin Arthur Harding is recorded as a thirty-one year old "Watchmaker & Jeweller". There is evidence that Arthur Harding was taking photographs during the time he was working as a watchmaker and jeweller in East Grinstead (1899-1906). It would be expected that Arthur would have received lessons in photography from his father William Harding. A number of photographs taken by Arthur Harding can be dated to around 1900. One photograph by Arthur Harding depicts an old windmill on East Grinstead Common and this derelict post mill was demolished in 1900. Another photograph showing a scene from the Urban District Election of 1901 is stamped on the reverse "A. Harding, watchmaker &., Glen View Road (sic)". Arthur Harding appears to have departed from East Grinstead around 1906. One of Harding's last dated photographs showed the declaration of the General Election result in East Grinstead in January 1906. The photograph, which shows the rival election candidates Edgar March Crookshank and the victorious Charles Henry Corbett, carries the caption "ET. GRINSTEAD, DECLARATION OF POLL. JAN 26.1906." By 1911, Arthur Harding had returned to the East Grinstead area and he was on hand to record the displays and processions which took place in the town on 22nd June 1911 to celebrate the Coronation of King George V.
When the First World war broke out in 1914, Arthur Harding was forty-five years of age, but as a member of the the local Territorial Army unit, he did not hesitate to enlist. 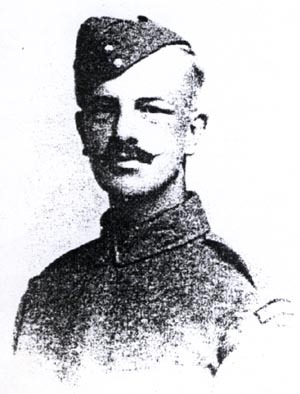 Harding served in the 4th Rifle Brigade of the Royal Sussex Regiment and saw action at Gallipoli in 1915. Arthur Harding was back in East Grinstead to photograph the Peace Day Parade which passed through the town on 19th July 1919. In the 1920s, Arthur Harding moved from East Grinstead to Brighton. Harding lived at 65 Hollingbury Road, Brighton and in the early 1930s he was still earning a living as a watchmaker. On 24th January 1931, at the Weslyan Chapel, Arthur Harding married thirty-seven year old Alice Maud Sippetts of 101 Ditchling Road, Brighton. Alice Sippetts had been born in Forest Row in 1893 and so Arthur might have known her family when he lived in East Grinstead. Arthur Harding would have been 61 years of age at the time of his second marriage. !n 1934, Arthur Harding and his new wife moved to Newbury, Berkshire, where he continued to work as a watchmaker. Arthur served as an ARP (Air Raid Precautions) warden in Newbury during the Second World War. Edwin Arthur Harding died at his home at 150a Bartholomew Street, Newbury on 4th January 1947, at the age of 77. The death certificate records the cause of death as "Syncope, Myocarditis & cancer of pancreas". On the death certificate, (Edwin) Arthur Harding's occupation is given as "Watchmaker". [ABOVE] A portrait of (Edwin) Arthur Harding (c1918). Another portrait of Arthur Harding wearing his ARP badge, photographed in Newbury, Berkshire, towards the end of his life, is held by the East Grinstead Town Museum. [ABOVE] The shop of Young & Sons, grocers & provisions merchants, at 39 High Street, East Grinstead photographed by Arthur Harding in 1911.The shop front is decorated with flags to celebrate the Coronation of King George V in June 1911. Edward Young, the proprietor, is standing in the doorway immediately to the left of the female employee, Lily Simmonds. 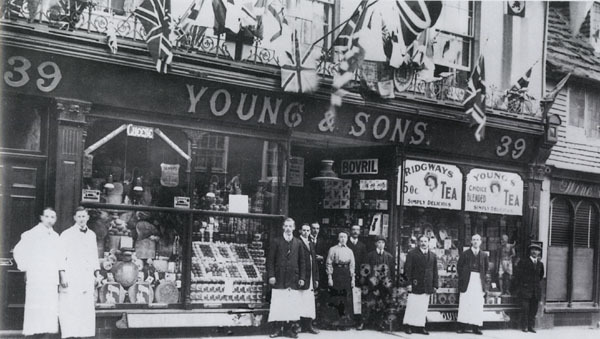 The grocery business of Young & Sons was founded by William Young (born c1830, Andover, Hampshire). Edward Young (born 1863, Northampton) took over the running of the business when Henry Young retired in the 1890s. A special thank you to Martin Hayes, County Local Studies Librarian of the West Sussex County Council Library Service. Thanks to Rachel Hurst of East Grinstead Museum for permission to use photographs from the Museum's collection. I am indebted to David Gould, Michael J. Leppard and the late Ron Michell for their work on the photographs and history of East Grinstead.